74 The PCB Magazine • December 2017 cause, contrary to popular belief (and with apol- ogies to Philip Crosby), quality is not free! Qual- ity as a way of life may require a fundamental cultural shift in some organizations, and ex- treme commitment from the person that signs the checks is absolutely the requisite first step down this transformational path. Current Culture Changing an organization's culture is one of the toughest tasks that can be undertaken. In most cases, the current culture has formed over many years of interaction between employees at all levels within the organization. Organizational cultures form for a reason, and changing the ac- cepted norm can sometimes feel like swimming upstream. In small, privately owned businesses, the current culture often matches the style and values of the company founder. Organizational culture grows over time and frequently mirrors the prevailing management style. Since manag- ers tend to hire people "just like me," the estab- lished culture is carried on through new employ- ees for generations. People are creatures of hab- it, and basic human nature dictates that they will typically be uncomfortable with change. 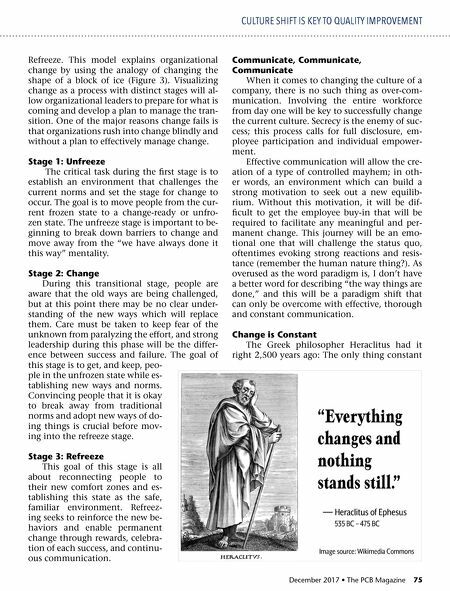 A key to overcome this is to acknowledge this hu- man nature predisposition and actively manage the change process through the tools and tech- niques discussed in this column. Sense of Urgency For real change to happen, leadership must demonstrate how important the effort is; in oth- er words, they must walk the walk. Dr. Joseph M. Juran recognized this truth over 40 years ago when he said, "Every successful quality revo- lution has included the participation of upper management. We know of no exceptions." This means a sense of urgency around the need for the culture change must be created that goes far beyond lip service by establishing an open and honest dialog about the importance of the change and how it will benefit all by improving organizational performance. Urgency is conta- gious; getting people to start talking about the change being proposed will spread like wildfire and feed on itself. 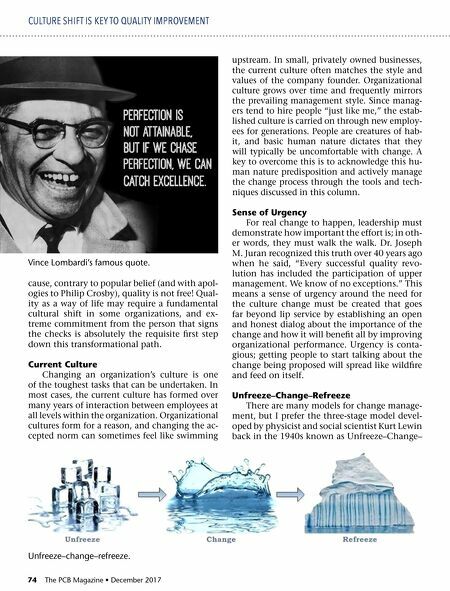 Unfreeze–Change–Refreeze There are many models for change manage- ment, but I prefer the three-stage model devel- oped by physicist and social scientist Kurt Lewin back in the 1940s known as Unfreeze–Change– CULTURE SHIFT IS KEY TO QUALITY IMPROVEMENT Vince Lombardi's famous quote. Unfreeze–change–refreeze.